What causes the various mutations like albinism in whitetail coats? Although I’m a wildlife biologist, I have never seen an albino deer in the wild. Within the last 15 years, however, I’ve observed six piebald (partially white) deer. We still have a lot to learn about these abnormal deer color phases, but let’s take a look at what we do know, along with some of the hunters who’ve had the rare experience of taking one of these once-in-a-lifetime trophies. These hunters are literally one in a million and are some of the luckiest in the world. Since the eyes of an albino lack any color or pigmentation, they always appear pink. That’s because the blood vessels can be seen through the deer’s iris, giving them a pink-like appearance. More often than not, this condition causes sight deficiencies and, as a result, these deer generally stick to dense forest cover. Albino deer also lack the gene for melanin, which generates normal coloration. Records of albinism for deer are extremely rare, but it is believed that albinism increases due to inbreeding. One unpublished record indicated that one in 30,000 deer are albinos. However, it’s important to note that wildlife agencies don’t generally record coloration data, and that figure might be too conservative. I recently conducted a seminar at the Dixie Deer Classic in North Carolina. After the talk, H.A. Woodlief showed me a picture of two albino does his son, Ryan, shot. H.A. explained that although Ryan is only 14, he has already taken his share of deer. With only three days before Christmas, H.A. and Ryan decided to hunt a relatively new area next to a 60-acre bean field. Although the joy of the season was filling their spirits, the previous four days of rain had almost kept them inside. With heavy rain still falling, H.A. gave Ryan the choice of which end of the field he wanted to hunt. Since Ryan was already tired, he chose the closest end and settled in for his morning hunt. Instead of taking an off-hand shot, Ryan slowly got off his bucket and used it as a make-shift shooting bench. At 200 yards, Ryan put the crosshairs of his scope behind the shoulder of the first albino and squeezed the trigger. As he watched the first albino drop, Ryan immediately chambered another round and tried to find the other albino in his scope. As the second white deer took off across the field, Ryan swung his rifle around and squeezed off a second shot, dropping the doe in its tracks. What made this hunt even more remarkable was although the bean field had not been hunted in two years, there was absolutely no talk of any albinos in the area. And if you’re wondering, the Woodlief hunters decided to make two flat skins out of Ryan’s albinos. Piebald is the term given to deer that are brown and white in color, similar to a pinto pony. Unlike albinos, which do not produce any pigment, some of the cells in piebald deer produce a color pigment called melanin. Although rare, piebald deer possess a recessive trait that is more prevalent in overpopulated deer herds. This genetic condition typically occurs in less than one percent of the population. In the wild, hunters are far more likely to see a piebald than an albino deer. Exceptions occur, but just like albinos, most piebalds are short-lived and usually have physical abnormalities such as short lower jaw bones, roman noses, short legs, deformed hooves and an arching spine. It’s important to note that some normal-colored whitetails carry the recessive gene for albinism or piebald coloration. If a normal-colored deer with a recessive gene breeds with a piebald deer, the end result will probably be a piebald fawn. Limited research indicates that two piebald or albino deer can produce offspring. But again, the long-shot odds of two recessive genes coming together are what make these deer so rare. When Corey arrived at my house, I couldn’t believe my eyes. I explained to him that such deer have recessive genes, and by shooting the spike he did the herd a favor. As Corey began to second-guess his decision to shoot, I asked him, “Why would anyone want to promote or protect something that wouldn’t pass the survival-of-the-fittest test?” After that, he felt better and decided to get a full-body mount of the buck. One week later, Corey saw a herd of 25 deer in the same area. As they got closer, Corey noticed one doe looked strange. When they got to 20 yards, he realized he was looking at a piebald doe. He immediately drew and released an arrow. The doe ran less than 35 yards and crashed into the brush. Corey’s second piebald deer had a strange 5-inch white stripe between the eyes and chin, as well as some pale white spots along its sides. Also, the doe’s lower jaw bone was 2 inches shorter than the upper. Except for Ryan Woodlief shooting two albinos in one day, my friend Corey had probably done what no hunter in North America had ever accomplished. I couldn’t help wondering how he was going to explain his taxidermy bill to his wife, but that’s another story. Unbelievably, one month later, Corey called me and said, “C.J., I had another piebald doe at 20 yards but just couldn’t get a clean shot.” Corey was bowhunting out of the treestand where he’d shot the piebald buck. The doe was walking directly to him but stopped, turned and walked away. Thus, Corey narrowly missed shooting three piebalds in one season! White deer are not always albinos. In fact, the only physical trait white deer share with albinos is the white hair. The eyes, nose and hooves of white deer have all the normal coloration we’d expect to observe. Although this color phase is rare, except for the white coat, these deer are the same as normal-colored whitetails. The epicenter of this white color phase is found at Seneca Army Depot in New York. Roughly 200 of these white deer are given protection by the U.S. Army within the confines of a 24-mile security fence. Although you can’t shoot the deer within the fenced area, every so often a white deer escapes, making it a highly prized trophy. Every species of animal has documented cases of albino individuals. No one knows for sure, but the same can probably be said about dark (sometimes black) or melanistic color phases. So rare are melanistic cases that most literature only reports that the coloration exists; no numbers are given about the prevalence. Melanistic deer result from an overproduction of pigment called melanin. With more than six million deer taken each year in North America, only a few melanistic deer are harvested, and it’s rarer than albinism. For whatever reason, most of these deer are taken within an eight-county region of central Texas. While albinism has no middle ground when it comes to color phase, melanistic deer exist in a wide range of dark colors, and shades exist from jet black to chocolate brown. Data indicate that melanistic fawns do not usually have the white spots characteristic of normal-colored fawns. And if these fawns do have spots, they’re barely observable. Additionally, the literature describes the velvet on a melanistic buck’s antlers as brownish and sometimes grayish in color. Although Pennsylvania hunter Andy Hargrove didn’t realize it, he probably had a better chance of winning the lottery than shooting a melanistic deer. Although Andy’s parents were not hunters, his best friend’s father, pastor Roger Hayslip, was. After three years of hunting with the Hayslips, it seemed that Andy was always so close and yet so far from harvesting his first buck. And although everyone was always pulling for him, mishap and misfortune followed the 17-year-old. Always surrendering the best treestands to Andy, the Hayslips knew it was just a matter of time. Finally, after several seasons of missed shots and opportunities, Roger thought he heard Andy’s gun go off. But, just like the two previous years, it turned out to be his son’s gun. After helping his boy field-dress and drag his deer out, they decided to head in for lunch. Andy stayed in the woods, and at 1 p.m., his decision paid off. Andy and the other hunters marveled over the nearly black buck, and although he heard that another hunter from the previous year had seen a black deer in the area, Andy always blew it off as a joke. Now that joke is a legend with a full-body deer mount to back up its authenticity. States that protect albino deer and the year the law went into effect are Iowa (1989), Illinois (1983), Michigan (1990), Hunting District 500 in Montana (1992), Oklahoma (1997), Washington (1980) and Wisconsin (1965). Piebald deer are protected in Iowa, Montana and Oklahoma. Iowa requires the deer to be 50-percent or more white, and Montana requires deer to be 75-percent white to be protected. All piebald deer are protected in Oklahoma. • Confessions of a Trail Camera Hater: New technology isn’t always good, but trail cameras are one tool that’s here to stay. • Rather Be Lucky: Just about every big buck story has at least a little element of luck involved. • Anatomy of a Scrape: A bare patch of ground can be a valuable piece of deer hunting real estate. 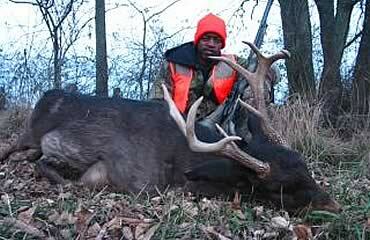 This article was published in the October 2008 edition of Buckmasters Whitetail Magazine. Join today to have Buckmasters delivered to your home.